How can the Mandela Rules be put into practice in Uganda and in other African countries? On 10 March 2016, PRI’s new Africa Office held a round table discussion in Kampala, Uganda on the implementation of the Revised UN Standard Minimum Rules for the Treatment of Prisoners (the Nelson Mandela Rules). Omar Phoenix Khan, Project Coordinator EXTRA (Excellence in Training on Rehabilitation in Africa) Project Coordinator attended the discussions, along with PRI’s Executive Director, Alison Hannah and Doreen Namyalo Kyazze, PRI’s Africa Programme Manager. This roundtable was the first in an early series of consultations PRI is holding with prison authorities, criminal justice experts and other interested stakeholders to discuss and take forward implementation of the new Rules at a national level. The Mandela Rules state that effective legal aid should be available to all prisoners, in accordance with international standards. Prison managers present agreed with the valid need for this advice for prisoners and noted that this would help the congestion in prisons. However, they also said that the reality is that there are not enough legal practitioners available in the country – and those that there are have no appetite to enter prisons. The group felt that despite the good work or some paralegals, the situation would not be able to be satisfactorily addressed until there is an increase in available legal capacity. Participants felt it would be possible to implement the required limitation on solitary confinement (defined as more than 22 hours per day without meaningful human contact) and to avoid prolonged solitary confinement (more than 15 consecutive days) and that this rarely occurred in Uganda. In terms of consistency, prison managers identified a need for more training for staff about the reasons for these standards and the mental health consequences for prisoners. A number of points were raised as obstacles to ensuring contact for all prisoners, with many linked to the size of the population and increase in diversity. Some prison complexes hold thousands of people, so within a context where the number of staff and their time is incredibly limited, it is not logistically possible to record all prisoners’ contacts, run security checks on them and facilitate regular contact. There was further recognition in the room that those still awaiting trial have the added need to communicate with legal advisors and to trace sureties, yet with the remand population currently up at 54%, it will be a huge challenge to achieve. 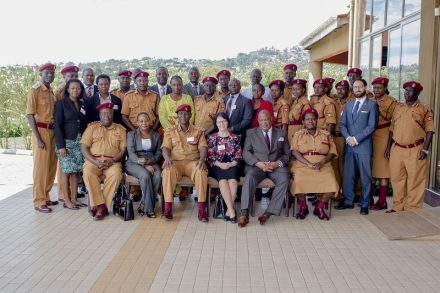 With increasing numbers of foreign national prisoners in Uganda, officers questioned how to balance prisoners’ right to receive letters or phone calls in their own language, whilst also satisfying security procedures when the language cannot be understood. Unfortunately the current situation results in the isolation of foreign nationals. In terms of face-to-face visits, it was felt that societal stigma was often an important contributing factor to why prisoners do not receive visitors, as people sometimes avoid visiting though fear of becoming associated with the prisoner or the offence. It was also noted that many family members do not have the funds to travel to visit prisoners, perpetuating social isolation. The Mandela Rules state that intrusive searches should be carried out by medical personnel. In practice, however, not every prison facility in Uganda has the medical staff to achieve this. Currently, the delay could be for days if establishments had to wait for a doctor. Some prison staff discussed the difficulty of balancing cultural or religious factors, such as Muslim women wearing niqab, with security procedures and searching. At the moment, most women visitors in this situation are turned away or forced to remove their headwear. PRI staff were able to give an example from the England and Wales prison system, where searching is carried out by a female member of staff in a private setting, so that visitors are still able to enter the prison whilst observing their cultural or religious practices. While officials recognised the importance of being able to deliver physical and mental healthcare to prisoners at the same standard as people would receive outside, it was questioned how this could be achieved with the current shortages of both resources and staff. In Ugandan prisons, for example, only about 45% of healthcare positions are filled and the service has failed to attract any psychiatric staff. After the reclassification of many police stations as establishments under the Ugandan Prison Service, a number of very small prisons are too small to qualify for formal staffing infrastructure and therefore do not receive any staff. In many prisons, sick prisoners are screened by ‘Ward Leaders’ – fellow prisoners, before being taken to the infirmary. Further assessment is then available at only 56 of 248 prisons. This informal triage system is useful in a practical sense for the prison, but is open to abuse from prisoners, who also have no medical training. It was also noted that staff lack the training to properly register births and deaths. Currently, on-entry medical screening only takes place in 33 out of 248 establishments, with a focus on TB, HIV and psychiatric needs, which indicates the extent of the shortfall. The Mandela Rules are significant in recognising the paramount importance of the safety and security of those working in prisons, as well as the importance of adequate pay, training and recruitment procedures. The situation for prison staff in Uganda, common in many lower resourced countries, underlines the gaps between the current situation and the new requirements. Participants at the meeting noted that the average staff to prisoner ratio is 1:7, double the official objective to have 1:3. Staff shortages mean long working hours and this has led to high staff turnover. Staff accommodation is basic and many junior staff struggle to feed their families. Rates of HIV infection are high for prison staff, with many contracting it in prison. On joining the service the HIV prevalence rate is 0-1%, yet upon later testing the staff population has a rate of approximately 15%, with the female rate closer to 20%. Antiretroviral drugs and supplements are provided for staff, but many choose not to use the prison health facilities. It was felt that while the strength of the stigma attached to HIV is slowly decreasing, staff still often avoid treatment or testing rather than reveal their status. Participants noted that many of the challenges in Uganda would apply across Africa. For example, the idea of a single cell per prisoner is not realistic, making certain sections of the Mandela Rules very hard to achieve. Even the conceptualising of what a prison is can be difficult – the example given was that in Sudan, a ‘prison’ may be no more than a roof. Interpreting requirements around restraints and security within this kind of context leaves many people not knowing where to start. Commissioner of Rehabilitation Services, Mr David Nsalassatta acknowledged that while in Africa the same kind of prisons or level of resources are not available as elsewhere, progressive change is achievable. Despite the recognition of many clear and obvious challenges to achieving the vision set out in the Mandela Rules, throughout the day, there were many expressions of support to new changes, particularly around respect for prisoners’ inherent dignity. Commissioner Nsalassatta, spoke about the great value of human rights training that he received from PRI more than fifteen years ago and emphasised the need for Uganda Prison Service Staff to receive training in the same vein, especially in the light of the updated Standard Minimum Rules. There was also a collective agreement that the operationalisation of the Mandela Rules will not become a reality until the UPS reassesses its own rules and standing orders in terms of compliance. There were calls for all prison services to take this introspective approach to ensure that the Mandela Rules can be realised as real change on the ground. Perhaps the most important first step is to ensure that every member of staff is aware of the Rules, of their implication and perhaps most importantly of what is expected of them in terms of their own attitudes and behaviour. Ideally every member of staff might be given a copy of the Rules and most certainly they should be an essential element in the training of staff. The successful implemenation of the Rules can only be achieved if everyone in the prison system, from the Minister in charge to the most junior member of staff – takes on board that it is their task to implement the Rules. Very good initiative. But perhaps also look at the rules as a compass to work towards? What really impresses me is the openness of the UPS in discussing its challenges. This is a good step to improvement of services and implementation of the rules. I have been following what is happening in UPS, this is a great step towards increasing compliance to the standards, professionalism in UPS and embracing good correctional practices. Great initiative.I think prisoners too have the right to know about this rules because it will save them alot.It is their right to have the information. As Corrections officer from Zambia and now working as Corrections Mentor in UNMIL co-located in Voinjama Central Prison, Lofa County of Liberia, I found this document very useful as it provided me with understanding of some of limitations and challenges faced by number of countries especially in Africa when it came the implementation of the Mandela Rules. However, it also has provided me with information on how some of these challenges could addressed within the available resources for example in post war countries like Liberia.